Ruggles & Jeffery supported the recent BKS Sports Awards evening celebrating the sporting achievements of young local footballers. Brian Ruggles, our joint Managing Director, presented the awards to the Youth Team’s Leading Goal Scorer won by Gabriel Annim, the Player’s Player of the Year won jointly by Gabriel Annim & Zach Churn and to the Club Player of the Year won by Michael Guy. For the senior team, awards went to Leading Goal Scorer won by Tom Ross, Clubman won by Matthew Roberts, Chairman’s Player of the Year won by Phil Ansell, Club Player of the Year won by David Rogers and Player’s Player of the Year won by Tom Ross. Ruggles & Jeffery has proudly sponsored BKS Sports FC for a number of years. 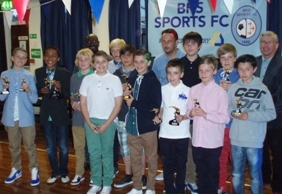 BKS is a grass-roots level club affiliated to the Essex County Football Association and compete at local league level.